Because of these articles, we receive quite a number of inquiries on how foot detoxification work. Once again, detox foot spa is a SCAM and no detoxification can be achieved through your feet. Do not be fooled by the changing color of the water tub. It's just a magic trick and a placebo effect. Yes, some of our subscribers told us that they tried it and found good results. Is that so? Please do not be fooled that detoxification method can be done through your feet. Our research groups found the right solution for foot detox, and here we will let you know how. People were mixed up with the idea of detox foot patch or pads. Detox foot patch is also nothing more but a huge scam and only yields placebo effect. Our medical analysis shows no detoxification result out of detox foot patch at all. Detox foot patch manufacturers are just stealing the ideas of nicotine patch and other medicinal plasters. Medicinal plasters do induce and stimulate the body. In the case of nicotine patch, nicotine is pasted with plaster. Nicotine enters the body through the skin, then we feel as if we have smoked cigarette. Nicotine patch is made for the purpose of making you stop smoking. Millions of people are affected from heavy metal poisoning, causing various kinds of diseases such as Alzheimer's disease, anemia, dementia, headache, kidney dysfunction, liver dysfunction, osteoporosis, and Parkinson's disease. Where do these heavy metal toxins come from? Aluminum foil, antacids, aspirin, auto exhaust, bleached flour, cigarette filters, construction materials, cheese, cosmetics, water, dust, atmosphere, milk, pesticides, salt, toothpaste, pollutions...you name it. It may contain heavy metal toxins that may accumulate in your body. It seems that modern medical technologies can do nothing to battle heavy metal poisonings. People are confused thinking that the detox foot spa system may be the savior of heavy metal poisoning. But alas, the answer is NO. Detox foot spa is a scam! Some spa parlors and sauna bath operators advertise that bathing in hot springs with high mineral content can remove heavy metal toxins in the body. You may feel fine and relax for a few hours or one day, but clinical test shows no reduction of heavy metal toxins in the body. 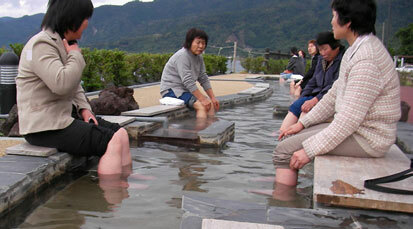 Footbath have originated from a Japanese legend occurred about 1,600 years ago. It was narrated by a group of sickly people and monks who made pilgrimage. One evening during that time, in a deep mountain, the group looked around to find a place to rest their exhausted bodies. They saw a hot spring streaming out of the rock where they decided to make their shanty for the night. Before sleeping, they placed their feet to the hot stream to relieve their fatigue. When they woke up the next morning, they noticed that they felt healthier than ever before. The group completed their pilgrimage, and they were informed by their physicians that their illnesses were gone. This occurrence of miraculous healing power spread around from villages to villages. Thousands of people followed the same route of pilgrimage, and some doctors and renowned physicians found that footbath has something to do with healing. From then on, the term “footbath” or “Ashiyu” in Japanese was born. In Japan, there are hundreds of hot spring footbaths for tourists to revitalize their health, as seen in the photos above. Foot bathing can be done by soaking your feet in a shallow hot water in a bucket. If your feet become warm, then your whole body will become warm, too, and you'll begin to sweat. The sweat may contain heavy metal toxins that come out through your blood vessels to your pores and to the surface of your body. You will feel relaxed just like you are taking a bath in a hot spring. The recommended water temperature is 40–42 °C and about 25 minutes per session. You can do it as many times as desired. Our PYRO-ENERGEN groups recommend the hot water footbath because of its cheap cost, and it's easy to perform. You can do it anywhere and anytime with no side effects at all. Once again, sweating through a sauna or steam bath do not match the same effect of reducing heavy metal poisoning. When doing a footbath, we really recommend you to add herbs in the hot water. The minerals and medicinal properties of herbs will help reduce toxins and will rejuvenate your strength avnd vitality even more. You can use herbs that are widely available such as dried radish leaves, dried carrot leaves, dried mugwort leaves, dried corn silk (maize), dried citrus skin, and dried ginger (grated). These herbs are good for revitalizing our health. Heavy metal testing kits can be found at your nearby drugstores. They are all cheap and are very simple to use. You can know the result instantly. Of course, sophisticated testing equipments cost great. Good luck and good health for all!